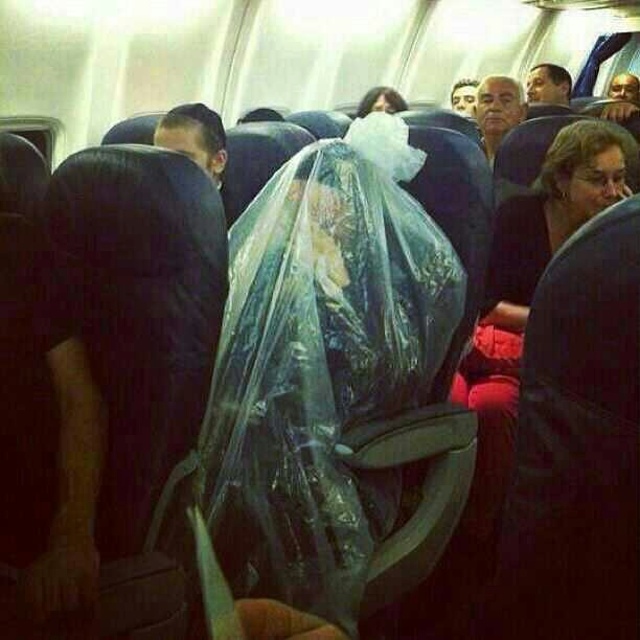 The above image – that of a religious Jewish man, wrapped in plastic aboard an El-Al plane – has gone “viral”. In the absence of any explanations, people simply made up their own. The Huffington Post’s religion correspondent originally declared that he was protecting himself from the presence of women – an idea that they’d not invented themselves, but which they had copied from the original Reddit post. Having been corrected, their updated article (with the exception of some nonsense about kohanim being “holy men”) at least gets the story straight. In short, the issue pertains to an area of Jewish legislation that deals with purity and impurity, and to a ruling that was issued by Rav Yosef Shalom Elyashiv. Rav Elyashiv, who died last year at the age of 102, was the leader of Degel haTorah: the Lithuanian haredi political party that frequently runs with the hasidic Agudat Yisrael under the name of United Torah Judaism. He was accounted by Lithuanian haredim the “gadol hador” – a phrase that literally means “the great one of the generation”, and that refers to his having been considered the halakhic arbiter par excellence. (The phrase has an interesting history, and one that reflects on the gradual concentration of authority within Lithuanian Orthodox Judaism. This is something that I discussed in an earlier post, shortly after his passing). Purity law is an extremely complex area of halakha, and most people are insufficiently qualified to be able to issue the sorts of rulings on this that were issued by Rav Elyashiv. To provide a very brief explanation of what is going on in the above picture, it is first important to bear in mind a couple of things. For a start, the biblical prohibition of a kohen defiling himself for the dead (eg: Leviticus 21:1-4) is understood by the rabbis, amongst other things, to extend to his inability to enter a cemetery. Secondly, it is also held that corpse impurity, if it rests on top of an object, extends upwards to the sky (Rambam, Hilkhot Tumat Met 19:5). There is some debate as regards whether or not corpses in Israel transmit impurity through to the surface of the ground anyway, since the law is that they need to be surrounded by slabs between them and the earth, and since the distance between them and the soil constitutes a break in the earth through which the impurity will not travel. This is also the case in Australia, where the law requires corpses to be placed in a box, rather than directly into the ground itself. The general understanding, however, is that since the slabs sink down with time until they are touching the body (and since the box deteriorates) the corpse impurity is still transmitted to the surface of the earth and, from there, upwards to the sky. All of this only applies to the corpses of Jews. There is a mishna in Eruvin 3:1 (26b-27a), which speaks of the food that one uses in order to symbolically extend the “Shabbat boundary”: the maximum distance that one can walk on Shabbat. This is also not a simple area of legislation, but the only important aspect of it, so far as this particular issue is concerned, is that the food be placed in a location that can be accessed by the person who is utilising it for this purpose. That would seem to mean, then, that if it were going to be used by a priest, it cannot be placed in a cemetery. Rabbi Yehuda, however, says that it can be placed there, since the priest can theoretically make a barrier for himself and enter. What is a barrier? Technically, it needs to be a completely sealed object, which retains its own shape, and which is comprised of something that does not contract impurity – such as thick plastic, in the case of this ruling. There are problems with doing this on an airplane (some of which are so obvious that they don’t bear mentioning), and the easiest solution is to simply not take flights that are going to go over Jewish cemeteries. That, by the way, is what most people do. But Rav Elyashiv understood the relevant passages to technically permit something of this nature and, notwithstanding the fact that it might be forbidden by the crew onboard the plane, it can assist a kohen who is forced to fly on a plane that, due to unforeseen circumstances, is now going to be flying over a cemetery. How the bag is sealed, whether or not (and when) it can be punctured to allow air holes, as well as the necessary thickness of the bag, etc, are all things that are explained in his ruling. In the Talmud’s elucidation of the mishna that I mentioned (Eruvin 30b), a debate is recorded between Rebbi and Rabbi Yosi as regards whether or not a priest who has been placed inside a box can be carried through the cemetery by others. Rebbi rules that he would become impure as a result, while Rabbi Yosi rules that he is pure. The way that the Talmud understands this debate is that a moving box is considered by Rabbi Yosi to be an obstacle to impurity (ie: “like a tent”), while Rebbi considers it no such obstacle. The Rambam codifies the opinion of Rebbi: a moving box is not to be considered “like a tent”, and won’t block the impurity. For our purposes, that means that while a thick plastic bag (which cannot receive impurity at all) will protect the kohen, the airplane in which he is sitting (being that it is a “moving box” made chiefly out of metal) will not. That said, however, there is another factor at play here as well, and one that explains why the vastly overwhelming majority of Torah observant kohanim would not behave in the fashion depicted above. There are two components to the prohibition of a priest entering the cemetery: that he not physically enter the cemetery (or pass above it), and that he maintain his purity. Only the first of those two components remains in effect today, since with the absence of any contemporary means of divesting oneself of corpse impurity, and given the ease with which it is transferred, we are all of us impure. As such, most people would not adopt the practice that is depicted in the image. By avoiding flights that fly over major Jewish cemeteries (and El-Al discloses which of their flights do and which do not), a concerned kohen is able to travel by plane and also fulfil his interpretation of this legislation. In the unforeseen event that he needs to change flights at the last minute, or his plane is rerouted, the issue is out of his control. He is not transgressing, therefore, by being onboard the plane. For him to construct a barrier around himself would be to try and fulfil the second component of the mitzvah, which is to maintain his purity: a moot point, given that he lost it already long ago. While most people would therefore view the above practice as an unnecessary stringency, it is probably worth mentioning that haredim who adopt it are unlikely to see it as anything other than a practical solution to a contemporary halakhic problem. The stringent position would be to stay at home.